This is the advance reading copy of Sacred Clowns. 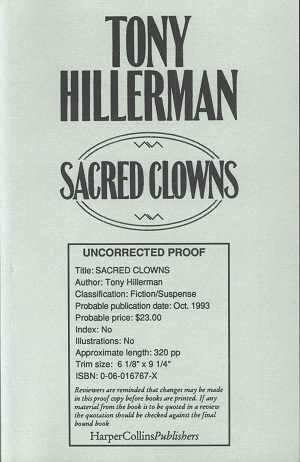 The eleventh book in Tony Hillerman's Navajo Mystery Series, Sacred Clowns features the newly formed Special Investigations Office team of Joe Leaphorn and Jim Chee of the Navajo Tribal Police. Format: Paperback, 21.2 x 13.6. Binding: Pale blue paper covers with publishing information printed on the front and the author, title, and publisher printed vertically on the spine in black.